For today's challenge, I decided to do closet triage and dig out this skirt that I don't believe I even wore last year. Time to make some decisions--does it merit taking up closet space? It could be this fabric holds the heat in a little more than I prefer, however, I still do love its styling and print. The skirt is layered, not tiered, so it doesn't overly flare out at the bottom, a plus for me. This is a different look than I usually gravitate toward, as my shirt is completely untucked, which is fabulous for easy dressing. (I know, "Gasp! ", right?!) Although, the criss-cross front gives it the illusion of a front tuck. 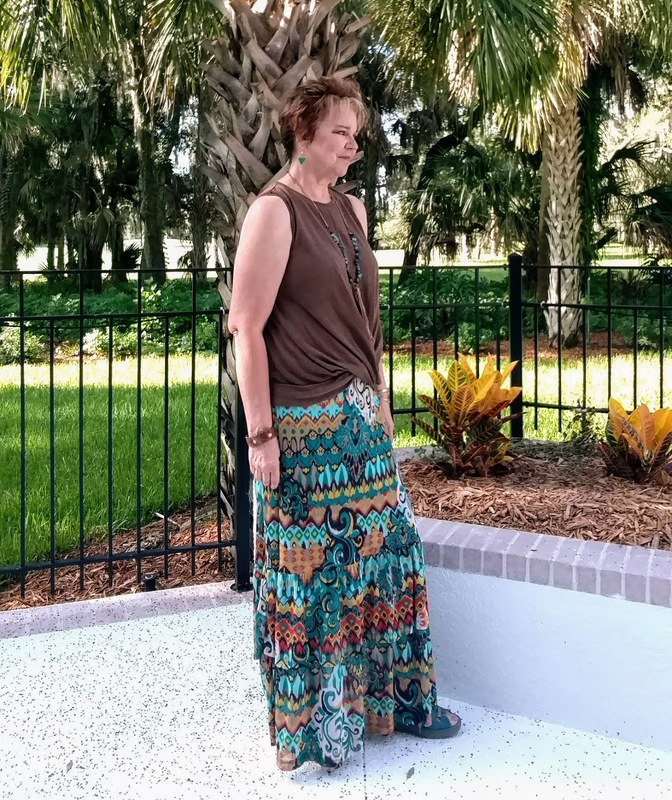 In the past, I've paired a silk butterscotch-colored long-sleeved blouse with this skirt, so the brown was quite a change. 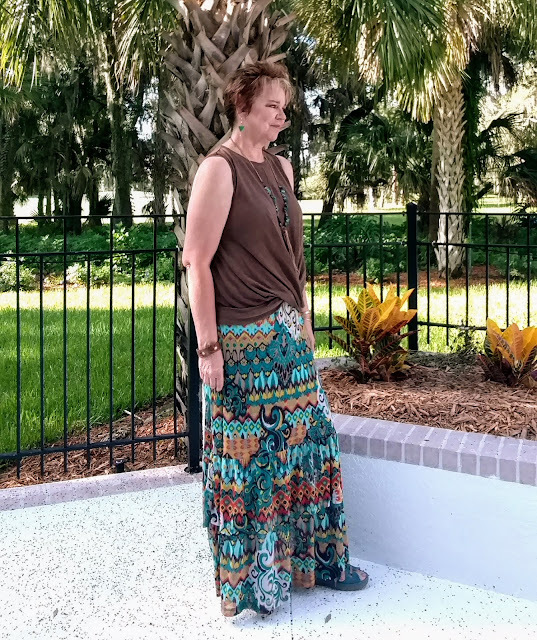 The skirt is a little long, so I added my chunky-soled sandals. Leather and stone jewelry was added to make a perfect running around town outfit. The feeling was put together, cool and stylish. My verdict: Keep the skirt and wear it throughout the rest of the summer. Bring out those orphaned clothing items in your closet. If they are a question mark, style them and wear them for the day. How do you feel? Did it bring up a reminder of why you ignored the item, or have you scratching your head as to why you haven't pulled it out sooner. Also, combine the piece in a combination you haven't used before to see if that makes a difference. I am glad you're keeping the skirt Kim! I think it looks great with that top. That criss cross styling is so nice, I find I am so f=drawn to tops like that! You look totally glam but comfortable too. Your shoes are just the perfect match for all the beautiful colors you have in that skirt! Love it! Thank you, Kellyann. I wasn't sure about the top, until I actually tried it on. What a delightful skirt! You look so chic and pretty! Great color blends too! Thank you, Nina. That was a new color blend for me. Love this look. You look stunning. The colors and proportions are just right. Great styling. Thanks for linking up to the Top of the World Style linkup party. Thank you, Nicole. I've been reading your blog for awhile and enjoy your style. That is an adorable outfit; I love the colors and the style. Thank you! It just goes to show you/me to look through our own closets!